Refer to the above diagram. Evaluate . 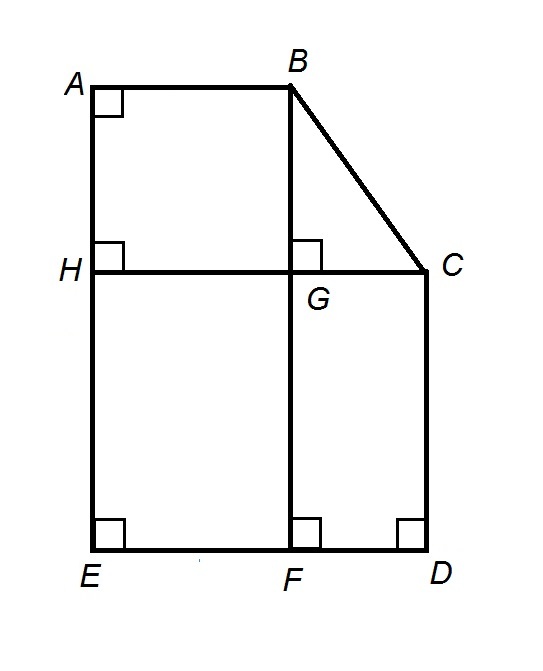 Refer to the figure below, in which has been constructed, and the top and right sides of the figure have been extended to their intersection to form Rectangle . Since opposite sides of a rectangle have the same length, , and by segment addition, . By substitution, , and . Refer to the above figure. Give the length of . 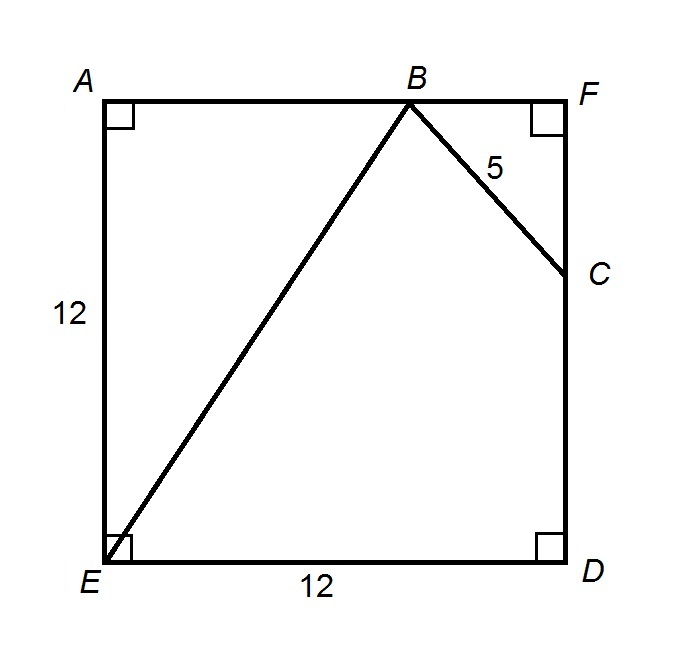 is the hypotenuse of a right triangle , so if we can determine the lengths of and , we can use the Pythagorean Theorem to determine the length of . Assume Statement 1 alone. By segment addition, . Since and are opposite sides of a rectangle, ; similarly, . It follows by substitution that . Since , it follows that , and . However, no additional information exists to find . Assume Statement alone. By similar reasoning, ; since , , and . However, no information exists to find . Refer to the above figure. What is the length of ? Statement 1 gives no helpful information, since the length of , which is not parallel to , has no bearing on that side's length. If we are given Statement 2 alone, then, as seen in the diagram, from segment addition, , from Statement 2, and from congruence of opposite sides of a rectangle, and . Therefore, , , and . Given a regular hexagon , what is the length of ? Statement 1: The hexagon is circumscribed by a circle with circumference . Statement 2: hs length 12. Below is a regular hexagon , with its three diameters, its center , and its circumscribed circle, which also has center . If Statement 1 is true. then the circle, with circumference , has as its diameter , which is 12; this makes the two statements equivalent, so we need only establish that one statement is sufficient or insufficient. Either way, , the radius of the hexagon, is 6. 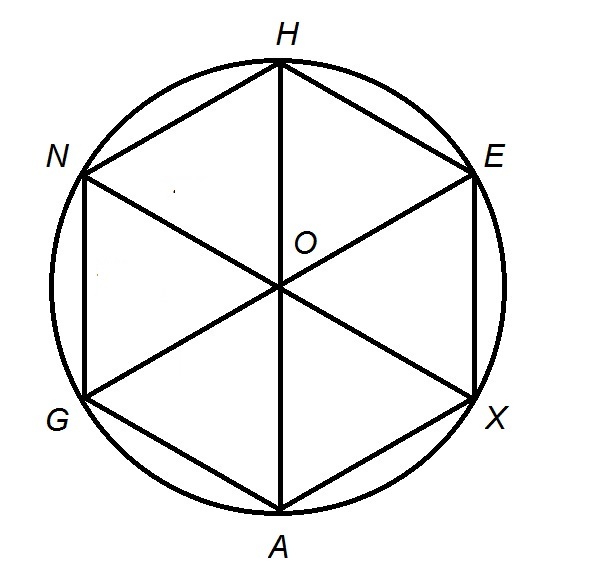 The six triangles that are formed by the sides and diameters of a regular hexagon are all equilateral by symmetry, so each side of the hexagon - in particular, - has length 6. Give the length of side of Hexagon . Statement 2: Hexagon has perimeter 42. Case 1: The hexagon could have six sides of length 7. 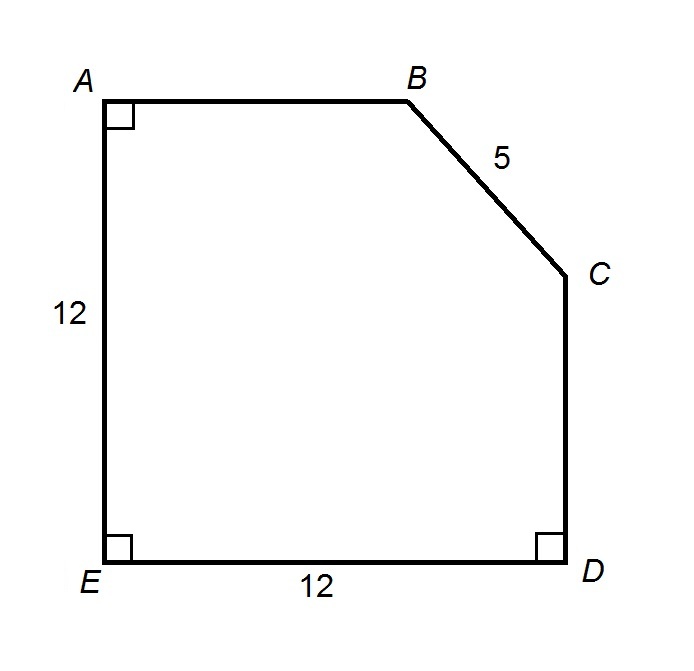 Case 2: The hexagon has four sides of length 7, one of which is , one side of length 6, and one side - - of length 8. 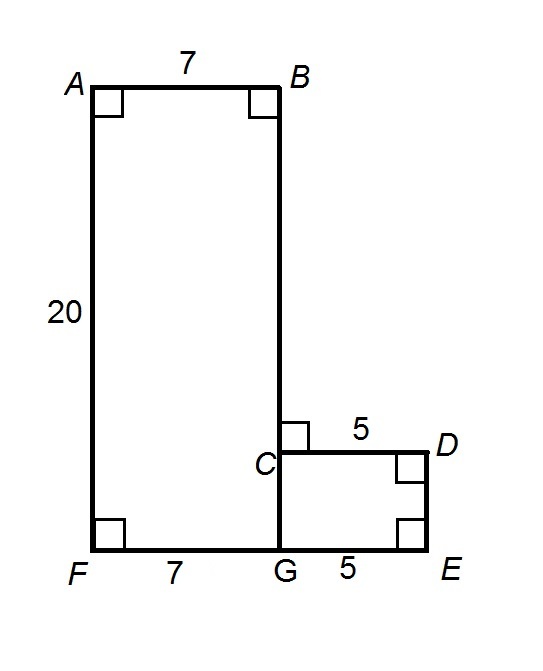 The conditions of both statements would be met in both scenarios, so the two statements together are insufficient. Give the length of side of Pentagon . Statement 2: and both have length 10. Statement 1 alone states that is congruent to two other sides, but gives no actual measurements. Statement 2 alone gives the actual measurements of two other segments, but without further information, such as how their lengths relates to that of , no information about can be inferred. Now, assume both statements to be true. From Statement 2, has length 10, and from Statement 2, , which is the same line segment (which can be named after its endpoints in either order), has the same length as . Therefore, . Statement 1: Pentagon has perimeter 50. BOTH statements TOGETHER give sufficient information to answer the question, but neither statement ALONE gives sufficient information to answer the question. Statement 1 ALONE gives sufficient information to answer the question, but Statement 2 ALONE does NOT sufficient information to answer the question. Statement 2 ALONE gives sufficient information to answer the question, but Statement 2 ALONE does NOT sufficient information to answer the question. BOTH statements TOGETHER do not give sufficient information to answer the question. EITHER statement ALONE gives sufficient information to answer the question. Statement 1 alone only gives the perimeter - the sum of the lengths of the sides - but gives no information about the individual sidelengths. (In particular, there is no indication that the pentagon is regular). Assume Statement 2 alone. and are two names for the same line segment, which can be named after its endpoints in either order. Therefore, . 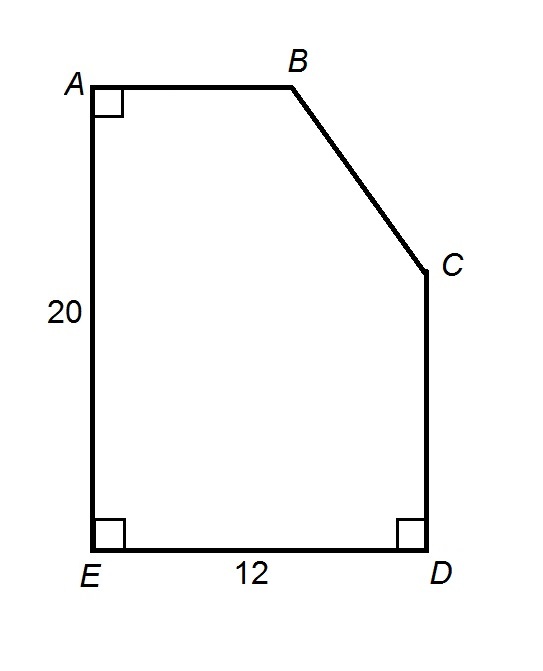 True or false: is the shortest side of Pentagon . Statement 1: Pentagon has perimeter 65. BOTH statements TOGETHER provide sufficient information to answer the question, but NEITHER statement ALONE provides sufficient information to answer the question. Statement 1 ALONE provides sufficient information to answer the question, but Statement 2 ALONE does NOT provide sufficient information to answer the question. EITHER Statement ALONE provides sufficient information to answer the question. Statement 2 ALONE provides sufficient information to answer the question, but Statement 1 ALONE does NOT provide sufficient information to answer the question. BOTH statements TOGETHER provide insufficient information to answer the question. The two statements together are insufficient. True or false: is the longest side of Hexagon . Statement 2: Hexagon has perimeter 66. Statement 1 alone only gives information about one side of the hexagon, and Statement 2 gives only information about the perimeter without giving any clues as to the individual sidelengths; neither is sufficient to answer the question. This means the sum of the sidelengths of the hexagon, which is its perimeter, is less than 66, in contradiction to Statement 2. cannot be the longest side. Columbia College, Bachelors, Physics. Northeastern University School of Law, Current Grad Student, J.D. expected.